530 g/m2 of soft, sumptuous microfiber! The Cobra Supreme 530 Microfiber Towel weighs in at a formidable 530 g/m2, which tips the scale as one of our thickest, most densely woven microfiber towels. Made of plush ultra microfiber, the Cobra Supreme 530 Microfiber Towel boasts a luxurious 75/25 blend of polyester and polyamide. Buff away waxes, wipe away glass cleaners, safely apply quick detailers- the Cobra Supreme 530 Microfiber Towel does it all! The Cobra Supreme 530 Microfiber Towel gets its name from its incredible thickness. Microfiber weight is expressed in "grams per square meter" or g/m2. The thickness of a microfiber towel is directly related to its weight. Higher weight = higher density = a thicker towel. At 530 g/m2, the Supreme Buff Microfiber Towel is incredibly thick and plush! No job is too big for the Cobra Supreme 530 Microfiber Towel! This ultra plush, ultra thick towel has a soft touch to pamper your vehicle as it buffs away waxes, polishes, and quick detailers. The unique blend of 75% polyester and 25% polyamide gives the towel a balance of softness and toughness to perform any detailing task. Buff paint, dust the interior, clean glass, and dry your vehicle. The Cobra Supreme 530 Microfiber Towel is soft and effective on any surface. The Cobra Supreme 530 Microfiber Towel is composed of millions of manmade fibers, each 100 times smaller than a human hair! More than 250,000 of these micro fine fibers per square inch compose this incredibly soft, plush fabric. 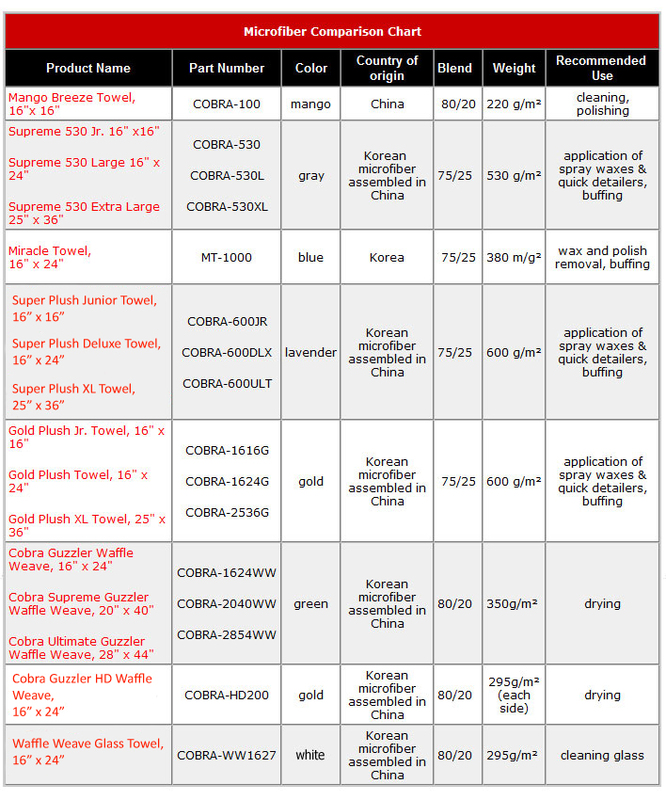 What sets the Cobra Supreme 530 Microfiber Towel apart from other towels is its thickness. The fibers are woven tightly to create an extremely dense, thick towel. The ultra thick microfiber absorbs a tremendous amount of moisture and even wipes glass to a streak-free shine. The Cobra Supreme 530 Microfiber Towel is an outstanding buffing towel. The thick towel feels as soft as the finest chenille. It glides over the paint, grabbing dust and massaging the paint to a brilliant shine. The nap is deep enough to pull light dust and dirt away from the paint surface where it cannot scratch. The microfiber-covered hem and removable tag further ensure a swirl-free detail. The Cobra Supreme 530 Microfiber Towel features double-sided construction, just like our Miracle Towel. One side of the Supreme Buff is plush and feathery soft. The other side has tighter, shorter loops for cleaning and polishing. Wipe off wax residue with the dense side of the towel and then flip it over for a gentle final buff. 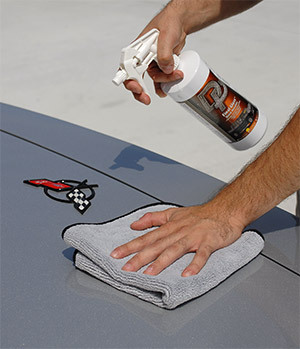 Both side of the towel are safe and gentle on any surface: paint, glass, metal, and plastics. Use the Cobra Supreme 530 Microfiber Towel for cleaning, too. It has a dust-attracting magnetism. Use the towel for dry dusting and watch how it grabs dust right off the surface. The powerful magnetic charge holds the dust so it’s completely removed from the surface. Plus, the Cobra Supreme 530 Microfiber Towel is lint-free. You have to sink your hand into the Cobra Supreme 530 Microfiber Towel to feel the difference! Your vehicle has never experienced a towel like this. Use it for dusting, buffing, quick detailing, cleaning, and polishing. No job is too big for the Cobra Supreme 530 Microfiber Towel! For more information on microfiber, click here.